The fascinating history of humanity’s bond with the horse is spectacularly brought to life in this beautifully illustrated volume. 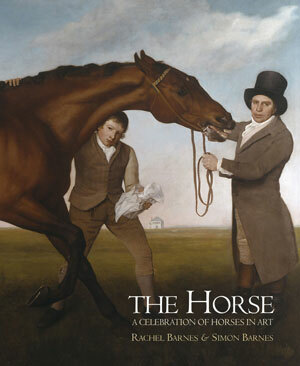 With over 100 giant images from the extraordinary Parthenon Frieze to the thoroughbred portraits of Stubbs; and from the enigmatic paintings of Edgar Degas to the contemporary creations of Damien Hirst, this book will delight horse and art lovers alike. Drawing on his extensive equestrian knowledge, Simon Barnes tells the story of horses and their unique relationship with humans. Rachel Barnes, as art historian, traces changes and development in Western art revealed through paintings and sculptures of the horse and explores the animal’s role as the subject of myth and legend, as a symbol of royal power and authority, as the subject of anatomical scrutiny and the embodiment of strength and beauty. The Horse covers the following periods: 1. Ancient civilizations and the horse; 2. The horse in the age of chivalry; 3. Horses in Renaissance and Baroque art; 4. Horses in nineteenth-century art; 5. Modern tributes to the horse. an invigoratingly fresh tack … Two different worlds meet in a wonderfully passionate appreciation of horsey pictures.